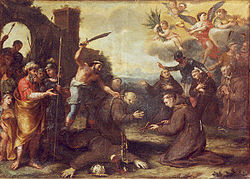 The Almohad movement was founded by Ibn Tumart among the Berber Masmuda tribes of southern Morocco. 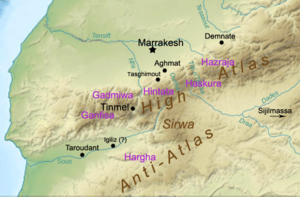 Around 1120, the Almohads first established a Berber state in Tinmel in the Atlas Mountains. 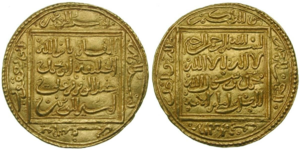 They succeeded in overthrowing the ruling Almoravid dynasty governing Morocco by 1147, when Abd al-Mu'min al-Gumi (r. 1130–1163) conquered Marrakesh and before the death of Ibn Tumart he declared Abd Almu'min as his successor as the second Caliph. 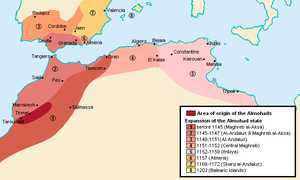 They then extended their power over all of the Maghreb by 1159. 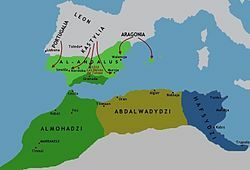 Al-Andalus soon followed, and all of Islamic Iberia was under Almohad rule by 1172.